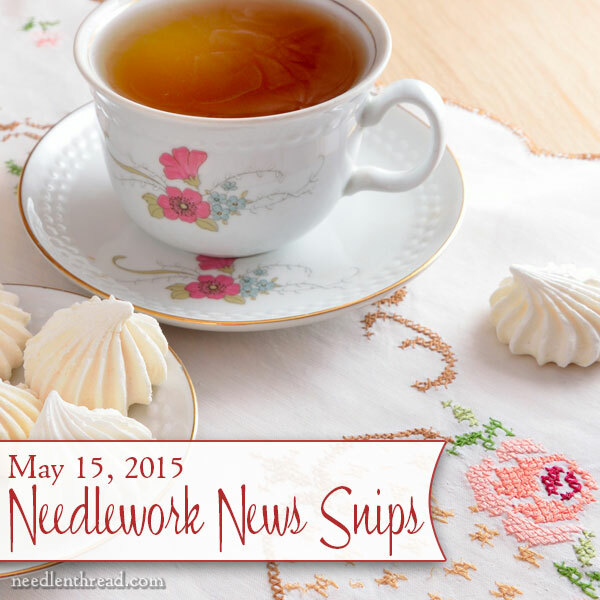 Needlework News Snips…good for a browse! We’ve reached the mid-point of May already, and it’s been a while since I’ve shared some little embroidery bits that have caught my eye lately. So, for your weekend browsing, here are a few online embroidery spots to explore – just a bit of inspiration and information from around the traps! So, when you have a quiet moment this weekend, pour yourself a cup of you-know-what (for me, it’s iced coffee right now, I’m afraid…) and let’s peruse some spots together. Portrait Embroidery – and Goldwork! Over on Charlotte Bailey’s blog, Hanging by a Thread, she’s got several articles on her forays into portrait embroidery. In her article Golden Haired Girls, she uses goldwork threads for blonde hair. I love the way she has built up the foundation for the hair, and especially how the padding helps impart a shaded look to the goldwork. She also discusses her stitching choices for the shading on the face – pretty neat stuff! Luzine Happel has done it again, with a very informative article on how she tested fabric suitability for Schwalm whitework. Whether Schwalm is Your Thing or not, the article is instructive – it illustrates the necessity of working with the right supplies for the job! Over on KerryStitch Designs, you can see some really colorful, fun examples of various stitch combinations on felt appliqués. Kerry’s making ingenious use of some of the stitches in Stitch Sampler Alphabet for her felt appliqués, and they look great! So there’s another good idea of what you can do with the instruction in Stitch Sampler Alphabet – it doesn’t have to be letters, after all. On her blog, Italian Needlework, Jeanine introduced us to a very intriguing (and, darn it, unavailable in the US!) new Italian embroidery magazine, Giuliana Ricama. The text of the magazine is, of course, in Italian. Browsing through the fantastic projects in the later issues admittedly brought a green tinge to my cheeks! Who knows? Maybe some day, they’ll extend the possibility of subscribing to enthusiasts outside Italy! Over on Thistle Threads, Tricia shared some great little stumpwork figures worth checking out, especially if you’re a 17th century stumpwork fan! Breath of Spring is back in stock at French Needle. This is a lovely kit featuring wildflowers and a bit of bug life. I embroidered the project a long time ago, when it came out in Inspirations Magazine – you can see it here. Now it’s available in kit form, with pre-printed fabric and specialty threads available. It’s a fun project – very much like a sampler, because there are lots of different stitches involved, but the result is a colorful, spring wildflower scene. There is nothing quite as glorious as silk shading done well, with silk! If you want to see an absolutely stunning example, check out the silk shaded pink anemones here on Jessica’s blog. She’s showing off some student work – all of it’s worth looking at (just exquisite! ), but the pink anemone is fantastic! Here’s an interesting article on embroidery – specifically, the Wikipedia entry on the Magna Carta, embroidered by prisoners and Embroiderers’ Guild members in the UK, to mark the anniversary of the Magna Carta. It’s going to be a wet weekend in Kansas – which is perfectly appropriate, because I’m embroidering ducks! I’m also thinking of throwing in a few frogs. Just because, you know… I’ll share progress with you next week. I’m also embroidering spots this weekend. Yes. Spots. I’ll tell you more about that, too. Several stitch tutorials are awaiting editing, so those will show up on Needle ‘n Thread in the near future, along with a bit of embroidery for relaxation. What are you working on this weekend? I hope you have a chance to indulge in some fun with your needle and thread! Frogs? My heart is leaping about in anticipation. I’m late after reading the newsy bits above so interesting. The portrait in gold is interesting, you can see that a lot of gold thread was used for the hair with great effect. I would love to do the course on stumwork figures as they look so intriguing I’m fascintated by needlelace embroidery. The wikipedia Magna Carta article is fascinating given they were embroidered by prisoners. Your article on Craftsty How to start Embroidery without a knot is so useful and I will apply these for future projects. I’m intrigued by your embroidery spots can’t wait to see them and really looking forward to the up and coming tutorials. I’m currently embroidering making Dorset Buttons I’m fascinated by them with the different colours, styles and threads they are so easy and interesting, I’ve made about 4 so far and hope to make more as part of the lace journal for my niece’s wedding next year. Thanks for all the newsy bits and I hope you have a great weekend. wigs made from gold bullion thread from the 30’s. My hat board has more versions. The golden haired girls reminded me of these. Thankyou for the link! 😀 As ever, a wonderfully informative and inspiring site you have here! Those little ducks are adorable! I look forward to your frogs and whatever else you decide to use on the gift you are making. I have two small great-nieces I would like to make coordinating summer dresses for, using your ideas for embellishment. This weekend though, I don’t get to embroider, I am still working on a Very Large piece of lace for the frontal of an altar cloth. It’s just a simple filet crochet pattern which I chose for simplicity, knowing ahead of time the size it needs to be. Our church is about 100 years old, so we actually have two altars. Depending on how quickly I can get one frontal done determines if there will be a matching frontal for the other altar. I too want to finish my hummingbirds! Ah, back to work. Have a relaxing weekend, Mary! About obtaining Giuliana Ricama, the new Italian embroidery magazine, you might give Lacis in Berkeley a heads up about this. They already carry a lot of Italian materials. Also, I used to pick up some treasures at Cavalli Book Store in San Francisco. It has a small newsstand. I used to drool on the knitting and I loved Mani di Fata. Now that we have PayPal, it is only a matter of time before something good like this becomes available. Then again, we could take collection and let Mary go to Italy and bring back a stack! Previous Previous post: Secret Garden Hummingbirds: Last Stitches, Finished!